By your argument then the pacers should be withdrawn immediately! Their bodies detach and crumple in an alarming fashion, and similarly would be inadequately protected in the event of a side swipe by another train. My point is that if it wasn't safe enough for Network Rail then it wouldn't be cleared to go on the network end of. I doubt Vivarail with their rail engineering expertise would build a train that wouldn't be cleared for operation by Network Rail. Firstly, I am not arguing that all existing stock, particularly Pacers, meet current standards. They are 30 years old and manifestly do not, although your point about bodies detaching is a little out of date. I presume you are referring to the Winsford incident, since which the method of attaching the bodies to the chassis has been completely revised. seems to be overlooked when (or if) D78s are deployed elsewhere in the country. I suppose it will have to be a case of waiting and seeing what transpires with Mr Shooter's enterprise. The Front of the D78s are getting a large revamp as part of the modification work. Part of said revamp is putting in a large crash structure (which I understand to essentially be a large steel plate) in a cross across the cab to reinforce it. It'll mean that should there be a crash, it won't behave any worse than a new generation piece of stock (such as the class 387s or 700s) - it will in all likelihood need to be built to meet modern crashworthiness requirements! As for TPWS, I thought it was mandatory for all trains to be fitted with it, which would include the D train? It's difficult from the head -on view Vivarail have provided to see exactly what the "crash helmet" fitted to the D trains will really look like, and how much of a crumple zone it will provide. As for TPWS, I think the point is that LU are allowed lower crashworthiness standards than NR because the chance of a collision is lower on lines with tripcocks. let them out on the Big Railway where TPWS is not universal (even if all trains are fitted, not all tracks are) and they need the same crash protection as everything else. The scrape marks are still there on the red column supporting the building! The barriers in that picture have now been replaced with concrete walls. ..there were a number of crash-worthyness modifications made to anchor the bodyshell to the underframe. Wasn't an ECS pacer written off more recently (2006ish at a guess?) in a collision? 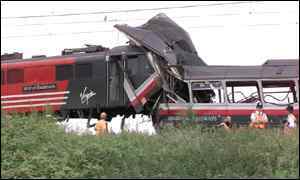 As far as I am aware only three Pacers have been written off: namely 142008 (Winsford), 142059 (Lime Street), and 143613 which was written off after a fire at Nailsea (near Weston super Mare) in 2004. 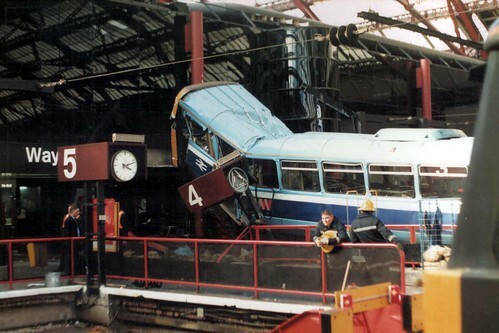 Only the last of these was in passenger service at the time of the incident. 142069 sustained serious damage to its underframe in a derailment at Rhymney in 2009 (in an ECS movement), and 142091 had major front-end damage after hitting a landslide near Retford in 2012 (in passenger service), but both have been repaired and put back into service. It is perhaps a sign of the rolling stock shortage that such repairs are deemed worthwhile (the earlier incidents happened during periods when new dmus were being built, so it was easier to get a replacement (not like-for-like"!) built. 143615 has also been scrapped, also as a result of fire damage. 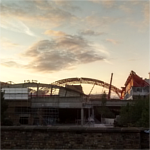 A couple of articles on progress with the trial conversion; one from Vivarail themselves and another from an environmental consultant welcoming the approach taken. Has anyone got idea when the prototype rebuilt unit will be showcased? Looks interesting. I note that the inter-car connecting corridors haven't appeared, but the seat used in the interior are certianly different! Tripcocks are only used on the Underground so there is no requirement for them on these reborn trains! 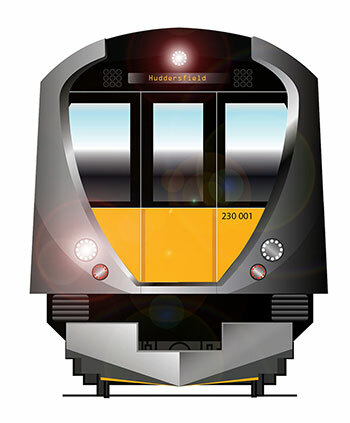 Network Rail appear to have confirmed that no assessment of crashworthiness is necessary as the units already co-exist with main line stock over a short distance of shared track in West London. The fact that tripcock protection applies here seems to be overlooked when (or if) D78s are deployed elsewhere in the country..
Haven't you missed the point? AIUI, lower crashworthiness standards are permitted on tripcock-fitted lines (including lines where where LU and NR trains currently co-exist) because the likelihood of collisions is deemed to be so low. Crashworthiness should therefore require upgrading if the D78s are intended to be used on non-tripcock lines. It should also be noted that although the D78s will not have their maximum speed increased, they will potentially find themselves on lines where other trains are permitted to go nearly twice as fast as they can, which will also make crashworthiness more important. Mr Shooter appears to have done his homework!